"The American Revolution" is a feature-length documentary film produced for festival, theatrical, and broadcast release. It's the story of how a radio station, politics and rock and roll changed everything. Long before Facebook and Twitter, before the Internet and GPS, underground radio was the social media of its day, connecting listeners and promoting the profound social, political and cultural changes of the late 1960s and early 1970s. "The American Revolution" chronicles free-form radio station WBCN-FM and Boston's other underground media, from 1968 to 1974, through the original sights, sounds and stories. Read more about and see the trailer for "The American Revolution." WEST 47th STREET is a feature-length theatrical documentary film. It follows the lives of four people with serious mental illness, over three years. The film provides an unprecedented window on the lives of people who are often feared and ignored, seldom understood. The film's producers enjoyed an extraordinary degree of access to their lives, and shot more than 350 hours of tape: off and on the street, in and out of hospitals and homeless shelters, healthy -- and psychotic. The resulting stories, both warm and dramatic, are about people who approach tremendous obstacles with humor, optimism and grace. At times hilarious and at other times tragic, West 47th Street represents a radical return to cinéma vérité, without interviews or narration. Set at Fountain House, a rehabilitation program for people with serious mental illness located in New York City's Hell's Kitchen. West 47th Street aired on PBS's POV and America Reframed, and won the Atlanta Film Festival. It was called "Must See" by Newsweek, and "remarkable" by the Washington Post. Click here to read more about West 47th Street. Click here to watch West 47th Street. "Back from the Edge" followed the success of Lichtenstein Creative Media's Peabody Award-winning "Voices of an Illness" series featuring the first-person accounts of people recovered from serious mental illness who provide an unprecedented window on their experience, with world-leading experts who put their stories into a health and science context. Click here to view "Back from the Edge." 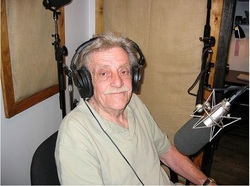 In August 2006, Kurt Vonnegut was interviewed on public radio from inside the 3-D virtual on-line community Second Life. The broadcast, produced by Lichtenstein Creative Media for "The Infinite Mind" public radio series, was the first to be taped inside a virtual world, and it was the author's last sit-down interview. 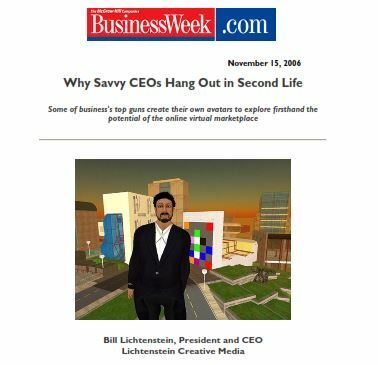 In Second Life, Vonnegut appeared with "The Infinite Mind" host John Hockenberry in front of an audience of more than 100 avatars from around the world in Lichtenstein Creative Media's 16-acre virtual broadcast center. Across the United States, tens of thousands of children are locked up in with adults in prisons and jails every year. This is not only immoral and unwise; it is a violation of the U.S. Constitution and of United Nations standards. And the threat is growing. Currently, laws are pending in Congress and in several states that would double or even triple the number of young people in adult prisons.If I Get Out Alive is a one-hour radio documentary, which exposes the systematic abuse and brutality faced by juveniles in the adult prison system. It is narrated by Academy Award-winning actress and child advocate Diane Keaton. The program addresses first-hand accounts from adolescents currently behind bars, rehabilitated youths who survived the system, parents of children who died in adult prisons, legal experts, policy makers and correction officers. The program also addresses the abysmal mental health conditions in prison and jails faced by young people (fifty percent of whom, according to new research, are affected by a serious mental illness) as well as examining alternative sentencing programs that are successful in diverting young offenders from prison. The Peabody Award-winning “Voices of an Illness” series, narrated by Academy Award-winners Patty Duke, Rod Steiger and Jason Robards, aired on National Public Radio and selected commercial stations across the country. They were the first programs to feature people living with and recovered from serious mental illnesses telling their own stories in their own words. The documentaries featured leading experts in the field who put the stories of recovery into a broader social and medical context including the difficulties in obtaining a correct diagnosis and treatment, the impact of these often misunderstood illnesses on the family, personal and social stigma, cutting-edge research into new medications and treatments, as well as discussions with patients in various phases of the illness, providing a message of hope and recovery. NPR stations called the series "unlike any programs of their kind... brilliant... extraordinary”; Time magazine called them “remarkable"; and they were hailed by the National Institute of Mental Health as "truly setting new standards of creativity and scientific accuracy in broadcast journalism." Click here to listen to the Peabody Award-winning "Voices of an Illness" programs. Bill Lichtenstein, president of Lichtenstein Creative Media, is a print and broadcast journalist with 40 years of professional experience, and 60 major journalism awards for his work, including a Peabody Award, eight National Headliner Awards, a Casey Medal for Meritorious Journalism, Cine Golden Eagle, three national news Emmy nominations, and a United Nations Media Award. He is a judge for the National News Emmy Awards and a screener for the duPont-Columbia University Awards. He has written widely for such publications as The New York Times, The Nation, Village Voice, New York Daily News, Boston Globe and Huffington Post, and from 1980 until 2005 was on the faculty of the New School University where he taught Investigative Reporting for Television and Documentary Filmmaking. From 1979 through 1986, Lichtenstein reported and produced investigative reports for ABC News 20/20, Nightline, and World News Tonight, and was one of two producer for the ABC-TV program "Jimmy Breslin's People." In 1990 he founded Lichtenstein Creative Media to produce innovative television, film and radio productions. Click here for Bill Lichtenstein bio. Click here for Bill Lichtenstein's CV. Click here for press clips on Lichtenstein Creative Media/Bill Lichtenstein projects.